Looking for the best books about Black Sabbath? If you want to know where that heavy sound in music came from look no further than the metal masters Black Sabbath. It was their sound in the early 1970s that helped to form the metal music we know today. Songs such as Paranoid, Iron Man, and N.I.B. helped forge a new form of rock music that was heavier and more aggressive than anything seen before. These books chronicle the live s of the founding member of Black Sabbath through to their lineup changes and the solo career of Ozzy Osbourne. They were pioneers in their day and their music is as popular today as it was back then. There can be only one Black Sabbath. Iron Man is a chronicles the life of legendary metal guitar player Tony Iommi and the band Black Sabbath. Iron Man reveals the man behind the music of black Sabbath but reveals his intelligence, humor, and warmth at the same time. He speaks honestly about his childhood and the accident that almost ended his career. He details his personal tragedies, failed marriages, battles with addictions, the other members of the band, and his overall life as one of the pioneers of heavy metal. This book is a detailed look at guitar player Tony Iommi and Black Sabbath. This book follows two members off the Black Sabbath crew form the 1970s as they tell the amazing stories of this legendary metal band. This book chronicles the bad behavior of the band as they grew in popularity and shows Black Sabbath as you have never seen them before. This is the ultimate tribute to the band that forged the roots of heavy metal for future generations. Get the stories first hand from those that were there at the height of the bands career. 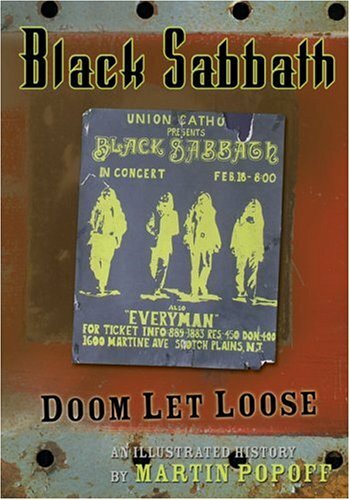 This book is a journey into the world of Black Sabbath the masters of metal. Through rare interviews, documents, and artifacts that span the career of this legendary band readers gain access to the life of one of the most famous bands in all of heavy metal history. The book contains never before seen photographs and new conversations that shed new light on the band. Every album, tour and song is looked at in this book with detail. This is the must have reference for any Black Sabbath fan. This brand new look at the metal masters Black Sabbath follows them from the very beginning up to 1975 when the band recorded their greatest albums such as Paranoid, Black Sabbath, and Masters of Reality. This book is a song by song analysis of the band’s work and how the stories of the day helped fuel the lyrics of these famous songs. This detailed look at these songs is a must for any guitar player interested in this music or for a general fan who want to know more about the music and not the band in general. This book follows the life of the legendary band and the various members and line-up changes through the years. It follows the careers of Ozzy Osbourne and Tony Iommi as they battled it out for control of heavy metal with constant lineup changes in their two bands. This book chronicles looks at the various lineup changes and includes information on famous players such as Ronny James Dio, Zakk Wylde, Randy Roads, Jake E. Lee, and more. The book is complete with over 140 photographs and new interviews. It follows the stories on the road and how the albums came to be. This guide will help you discover everything there is to know about the masters of heavy metal, Black Sabbath. I heard that Frank Zappa said that one of their (Black Sabbath) songs was the finest rock song ever made (i am paraphrasing), but then he heard one of their other ones that made him change his mind and say it was the new one. Is that true? it was a drunken story I heard from an old rocker, but I would personally like to know what the songs were.